First of all, thank you for your kind thoughts and prayers for Kirsten and her family. She’s an amazing woman, and I cannot believe how strong she has been dealing with the loss of Alex. I will actually see her this weekend – she’s the one who planned the Kennywood trip almost 2 years ago. I know she really wanted Alex to be a part of the trip, so it’s going to be something of a bittersweet day. So, if you look at my progress bars, you’ll notice some changes (because I know you all sit with bated breath waiting to see what I have been working on, right?). I finished up take 3 of the Happy Valley socks and wore them all day on Wednesday (they cam off the needled and went straight onto my feet). I don’t have any new pictures, but they pretty much look like they did here, only with about 10 rounds of ribbing at the top. I also finished the second quilt! Which is good, since it is going to PA with me, um, tonight. (Mom and I are consolidating and shipping our gifts to California together) I used the same pattern as on Renee’s quilt, only arranging the squares a little differently. I’m really happy with how it came out. I hope Beth and Mike (the parents-to-be) like it as well. Baby will also be getting the now-ubiquitous One Skein Baby Bolero made from KnitPicks Shine Worsted, this one in “Reef”. I am seriously loving this yarn, and trying to decide on a project for ME made from it. 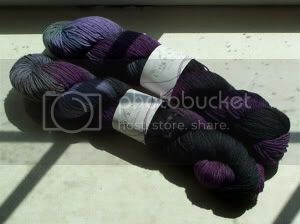 I have until sometime in June before I can order yarn, though, so I definitely have time to decide. And since I finished a couple of deadline projects, I of course had to start another one! I cast on last night for what I am calling Kris’s Pirate Socks. These are being made from Lorna’s Laces Shepherd Sock in “Black Purl”, which I bought because I thought he would appreciate the Pirates of the Caribbean “Black Pearl” reference. I decided that I didn’t want to make them just out of that single yarn, though, so I came up with an idea. The toes and heels will be done in KnitPicks Essential in “Black”, as will the ribbing at the top. The rest of the sock will be in the Black Purl, with the exception of an inch or two below the ribbing, where I am going to attempt to do a band of Fair Isle skulls like the ones on this hat. The skulls will be done in Patons Kroy Sock in Muslin, and the background will be the LL. These are going to be either super-cool socks, or a total diaster. So far, I’ve done the toes (short-row on 2 circs, natch), and about 10 rounds of the foot in the LL. I’ll take them with me this weekend, although I’m going to be driving tonight, so I won’t be doing much knitting. Well, I need to go pack and do some cleaning around here (which also means I am not entirely sure I will get to Annapolis for the knitting meetup today, although I hope to – I love that bunch!). Have a great weekend! I should have Kennywood pictures when I get back! 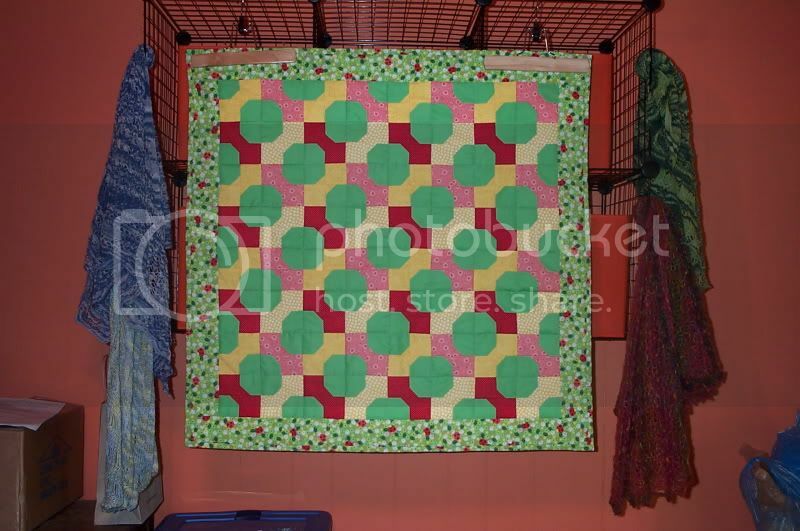 May 25th, 2006 | Tags: FOs, Knitting, Sewing, WIPs | Category: Misc. I can’t WAIT to see the Black Pearl socks, you genius, you. wow those are some great gifts, that baby is so incredibly fortunate to have such loving gifts. Love the quilt and BB! Have a great trip and we better see pics of Kris’s socks when you get back, finished or not LOL! I love the sound of those black pearl socks! Can’t wait to see them! And the baby bolero is fab. I’ve heard lots of great things about the Knitpicks Shine and I really like that reef color. Hmmm…how much left on the old mastercard?